Today we will focus on a kanji 「気」( = ki) ! 気 means “feeling, sentiment, mind, air”, or something more profound or spritual, like “active (life) energy” , “undefinable power”, or “prana”. Let’s start withthe expression「気を使う（or 遣う）」= ( Ki wo tsukau) ! = Maggie niwa kiwo tsukau naa. meaning Cookie (remember Cookie is a male pooch) feels like he is compelled to pay special attention or to show concerns, be careful, sensitive or attentive towards Maggie not to make her angry or upset or to make her happy. Usually you use “ki” (being more attentive or paying attention) when you are around your supervisors or somebody you think they are superior or sensitive or sensitive things as well. = Why don’t you be more attentive/sensitive! = Douka (o) kiwo tukawanai de kudasai. = Don’t bother. Don’t worry about me so much. Please relax! There are lots of 「気」”ki” words and expressions. I will show you only a part of them. 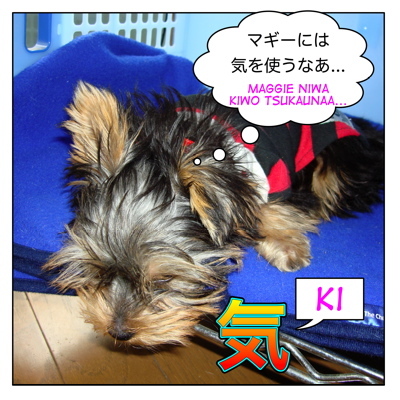 空気を読む ( = kuuki wo yomu ) ：to read between the lines/ to sense what is happening around you or people’s feeling around you. = He can’t read between the lines. = Koko wa ki no nagare ga ii desu ne. = Motto kiraku ni douzo! For those who have already known lots of ki-expressions, I made a following check test so please try to fill the blanks! がんばって！ ( = Gambatte) Good luck! = Anata no okurimono, tottemo kini ( ) mashita. = Kuruma ga kuru! Ki wo ( ) ! I feel overwhelmed by just thinking about how much money it would cost from now. = Korekara doredake okane ga kakaruka kangaeta dakede ki ga ( ) narru. = Ki no ( ) kana? = Kanojyo wa ki( ) ga takai node mina ga kiratte iru. = Watashi no koto wa ki ni ( ) naide. = Ki ga ( ) kara hanashi kakenai de. = Kare wa hontou ni ki ( ) nanode shinyou shiteinai. = Kare wa kanojyo ni ki ga ( ) masu ga kanojyo wa kare ni ki ga ( ) masen. = Jyon to maggie wa ki ga ( ) masu. 出来た？( = Dekita?) Did you finish them? = Motto ki wo tsukatte yone! = Be more attentive, OK? 先生！please also make a little lesson or maybe explain just explain about the use of 気がする？i’ve seen this a lot too. OK, will add 気がする on the request lesson. It is not that complicated so I might just post it on Facebook page. One of the usage of (~が）する is to express one’s body’s symptoms. **Sometime I leave comment with username アリナ because i read your blog anywhere and using any kind of gadget in my hand (laptop/ipod/bb etc). 「もっと気を使ったら？」 motto kiwo tukai nasai!